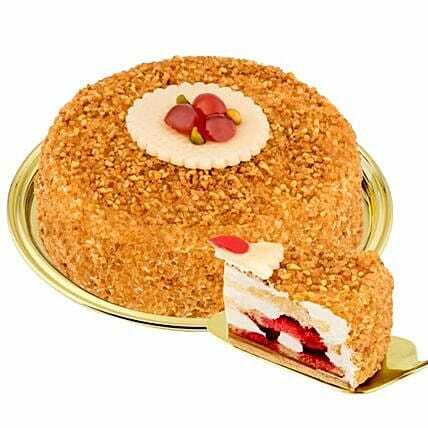 Handmade confectioner cake based on the "Frankfurter Kranz" with wonderful butter cream filling and a hazelnut brittle covering. The cake weighs aprox. 600 g. and has a diameter of 16 cm. The cake is delivered in a fail-safe gift box. "I ordered a cake for my brother in Frankfurt, the cake was delivered on time . It was his birthday and have never missed cake for him. YOU GUYS MADE MY DAY._x000D_ Suggestion: you need to update the tracking number in the website that helps a lot"